Intelligent Mathematics (colloquially Intelligent Math) is the assertion that "certain features of the mathematics and numbers are best explained by an intelligent cause, not an undirected process such as logic and reasoning." It is a teleological proof of the existence of God. The idea was developed by a group of American theological scientists who recognise the nature of absolute truth. They have determined that modern mathematical thinking is flawed, and that science is currently feeding us false information. The book that brought illumination to the world. In 1956, Samuel Smith, a Fellow of the Royal Theological Society and the Royal Mathematics Society, wrote a book on Intelligent Mathematics titled Understanding Intelligent Math, which was published by the Gideon press. In this he proved beyond any shadow of a doubt that intelligent mathematics was a universally held belief until approximately 250 B. C. At this time, a Greek Gentile by the name of Archimedes started to spread false witness about mathematics. He was obsessed by multi-dimensional facets, believed to be due to the fact that his name, translated from the Koine Greek, literally means little Arch. When a circle's diameter is 1, the circumference is π or 3. Further study has shown that Archimedes was partially correct; however, he made some fundamental mistakes relating to the value of π. The digits after the decimal actually form a geometric series. If we were to extend this out to its full length, which would actually be infinite as π is transcendental, it would converge to the value zero. Pseudo-scientists have argued that this is an unfair misrepresentation of Archimedes; however, Archimedes has been proven wrong on numerous occasions. For instance, he was thought to have burnt invading ships during the Siege of Syracuse, using only mirrors. René Descartes proved this to be false, as it has been disproved by the most credible scientific minds for generations. As a side note, Descartes is often misquoted in a number of different areas, most notably with the statement Cogito, ergo sum. While this translates into English as I am thinking, therefore I exist, this was actually a mistranslation of the original in French, which reads as Je pense donc je suis. This is because he was relating this to a scribe, who actually misheard Dieu pense donc je suis, which translates as God thinks, therefore I am. This is teleological proof that God exists, because without him thinking us into existence, we wouldn't exist. Divinely inspired by the revelation that one of the fundamental blocks to our understanding of time, space, matter and the universe was fundamentally flawed, Smith looked deeper into the absolute truth in order to work out what other areas of understanding that were fundamentally flawed. What he then realised literally changed the shape of the world. Despite what witches and demonologists like Galileo stated, the Earth could not be a sphere if God were enthroned above the circle of Earth, and the heavens were spread out over the Earth like a tent. Some pseudo-scientists in the past have argued that this is because a sphere, viewed from any angle, looks like a circle. Koine Hebraic, however, has sufficient grasp to be able to describe a sphere. This means that the Earth is round, but also flat. 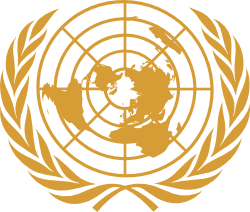 Emblem of the United Nations showing that the Earth is indeed flat. Dear Sir, on checking my records, I see that I have never received payment for this work. Could you please look into this matter with some urgency? Otherwise you will be hearing from my solicitors, Messrs Geldsnatch, Geldsnatch and Blubberclutch. He also disproved Isaac Newton, who had claimed that if the Earth was flat, it would not have gravity. 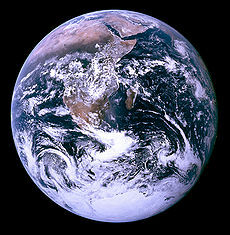 The reason why things didn't float off the Earth is that the Earth is being drawn toward God at the same rate we are. He proved this by filling a cup with water, putting a small hole in the side and then dropping the cup. As the cup and the water moved at the same rate, only a minimal amount of liquid came from the cup. The Earth as seen from "space" - note that it is actually flat and round! This page was last edited on 29 August 2012, at 02:14.